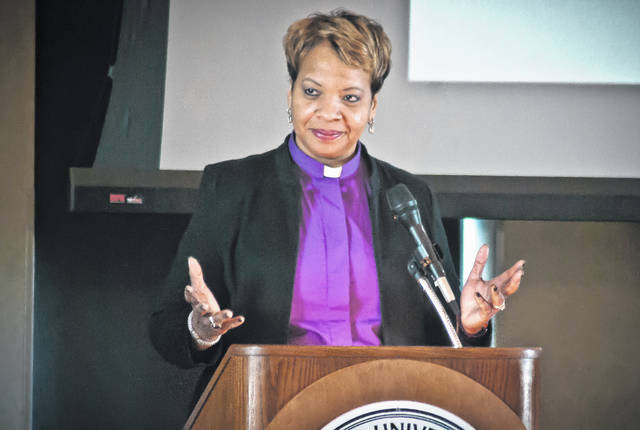 Bishop Tracy S. Malone, resident bishop of the East Ohio Conference of the United Methodist Church, served as the featured speaker of this year’s annual Martin Luther King Jr. breakfast Monday morning. Though temperatures were below zero, the Benes Room at Ohio Wesleyan’s Hamilton-Williams Campus Center was filled to capacity for the 26th annual MLK Breakfast Celebration. Subzero temperatures didn’t detour a large crowd from attending Monday morning’s 26th annual Martin Luther King Jr. Breakfast Celebration held in the Benes Room at Ohio Wesleyan’s Hamilton-Williams Campus Center. “Many are cold, but few are frozen,” said Jon Powers, Ohio Wesleyan University chaplain, before introducing this year’s celebration theme. Powers said the celebration was only the “tip of the iceberg” as to where the community will go this year. The celebration’s featured speaker — Bishop Tracy Smith Malone — was introduced by Ohio Wesleyan University President Rock Jones, Ph.D., as a prophet, a pastor, a leader and a friend. “She is a woman of integrity. She is a woman of passion, and she is a woman of deep humanity whose humanity extends beyond the region which she serves,” Jones said. Malone said she could tell Delaware is a “Beloved Community” just by what she noticed while walking into the room on Monday. Malone said it has been 51 years since Martin Luther King Jr.’s assassination, and there are two moments in history that will forever be etched in people’s memories — King’s “I Have a Dream” speech in 1963 and his assassination in 1968. “It was a direct call to change in the social order of society,” she said. Malone said King’s dream confronted racism, inequality, and poverty in society. She said it was a call to action, to greater moral character, civility, and a call for community. It was a movement to act against injustice. Malone said race and racism exist and continues to play a role in American society today. She said it creates victims of homeless, joblessness and food insecurity. Malone is resident bishop of the East Ohio Conference of the United Methodist Church, and she serves on the boards of trustees at United Methodist-affiliated colleges, seminaries and organizations, including Ohio Wesleyan. Elected to Episcopacy in July 2016, she is president of the General Commission on the Status and Role of Women and is a member of the Board of Trustees at Garrett-Evangelical Theological Seminary in Illinois. She earned her Doctor of Ministry degree from the United Theological Seminary in Dayton. This entry was tagged Bishop Tracy S. Malone, D. Anthony Botkin, Jon Powers, Martin Luther King Jr., Ohio Weslayen University chaplain, Ohio Wesleyan, Ohio Wesleyan University President, Rock Jones Ph.D.. Bookmark the permalink.